Tarot.com Has a NEW Logo! 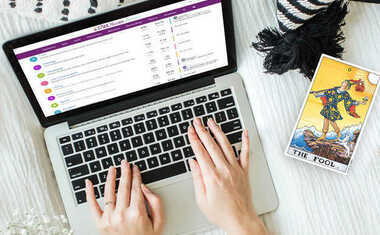 As a loyal Tarot.com member, you've probably noticed all the changes we've made around here the past few years. From easier navigation to quicker access to your account information to a more mobile-friendly experience, we've been evolving in ways that enhance the look and feel of our site. As we made those improvements, we realized there was one key area we hadn't yet spiffed up: our logo. We loved our old design and it served us well for many years, but we felt it was time to have a more modern logo that reflected all the things we do here at Tarot.com. Learn more about how our updated design incorporates Astrology, Tarot, Numerology, and more! 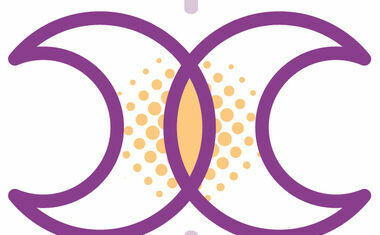 This logo is largely based on the concept of the Triple Goddess symbol. She guides us through all phases of existence, from birth to death to rebirth. She reminds us to embrace the lessons life teaches us as we move through our own personal cycles. If we accept the gifts the universe is offering us at each stage of our journeys, we can live with joy and truly thrive. The Triple Goddess symbol also depicts the Moon's waxing, full, and waning cycles. This can be seen in the overlapping icons in our new logo. On the left is the Waxing Crescent Moon, in the center is an abstract representation of the Full Moon, and to the left is the Waning Crescent Moon. A Crescent Moon gets its name from the Latin verb "crescere," which means "to grow." We believe in the power of personal transformation, so it was only fitting we included a nod to this in our logo. Coincidentally, this Moon phase is also associated with The High Priestess card! Our new design is also modeled after the crown The High Priestess adorns in the Tarot. The High Priestess represents intuition, divine knowledge, and the wisdom to be gained from listening to our inner voice. She sits between the conscious and subconscious worlds, encouraging us to tune into the signals the universe sends us through our dreams or flashes of insight. She serves as a reminder that the answers we seek are always within us. The three dash marks that are above and below the Moon icons represent the number 3 and 33/6 in Numerology. The number 3 is innovative, lucky, and able to laugh in the face of life's roadblocks. The number 6 -- which can be derived from the Master number 33 -- is considered the most harmonious of all the single-digit numbers, embodying a loving and caring energy that encourages doing good in the world. Staying true to our roots, we've left a symbol of the old Tarot.com candle flame design in the center of our new logo. It represents one's own internal flame and inner knowing. This updated look not only reminds us of our history, but also keeps an eye toward the future. We're excited about this next phase of the Tarot.com brand and hope you are, too! We'd love to hear what you have to say about our updated design, so please let us know in our FREE forums.